The alleged corruption at football’s world governing body FIFA plunged to new depths this week when U.S. authorities charged more than a dozen officials with embezzling money from the organization. Two FIFA vice presidents were arrested in Switzerland even as the body’s executive committee met to discuss key reforms. This week was meant to mark a new chapter for FIFA – a key vote was approved on reforms designed to turn it into a "trusted and professional sports organization." Instead, the scale of that task was made clear as 16 FIFA officials were charged Thursday by U.S. authorities, who allege that huge sums were siphoned off, intended to help natural disaster relief and grassroots football programs, and lucrative media rights sold off for bribes. The charges target several of the most senior football executives in South and Central America. 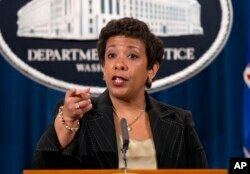 U.S. Attorney General Loretta Lynch said huge sums were involved. U.S. Attorney General Loretta Lynch discusses the FIFA corruption case at a press conference in Washington, Dec. 3, 2015. "The scale of corruption alleged here in is unconscionable. And the message from this announcement should be clear. To every culpable individual who remains in the shadows hoping to evade this ongoing investigation: you will not wait us out and you will not escape our focus," said Lynch. The U.S. charges came hours after the arrest of two FIFA vice presidents by Swiss police. The allegations lay bare the hypocrisy at the heart of FIFA, says sports historian Philip Barker, who spoke to VOA on Skype. “The kind of coaching facilities that they are setting up, the coaching expertise that they’re sending in, it all does come across as rather empty when it turns out that people are actually enriching themselves from the funds that are supposed to be helping football at the grass roots. It’s very disturbing," said Barker. Eleven current and former members of FIFA's executive committee have been charged in the U.S. investigation. The acting president of FIFA, Issa Hayatou, pledged full cooperation. "The arrests underscore the necessity to establish a complete program of reforms for FIFA," said Hayatou. Those reforms include reducing the power of FIFA’s executive committee and greater transparency. The body is due to elect a new president in February, but the criminal investigations could engulf that process, said Barker. “This is one of the big problems with the FIFA investigations, that those who are perceived as being the new broom that might help to clean out the house have also been subject to allegations," he said. Meanwhile, former President Sepp Blatter is suspended as part of a separate investigation by Swiss authorities into a $2 million payment to European soccer head Michel Platini.